Trust us, avoid these wedding mistakes and celebrate the perfect day! When it comes to your wedding planning, there’s so much going on that some things are bound to turn out slightly differently to how you imagined it would. 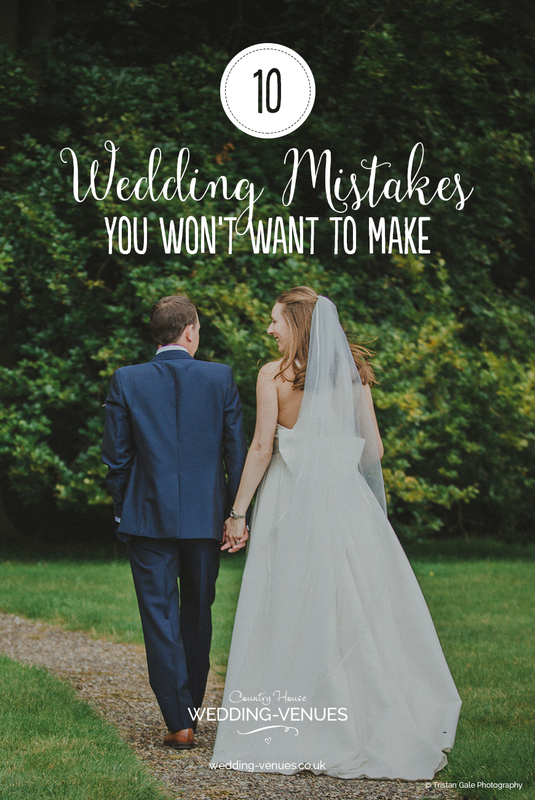 Some things are definitely avoidable however, so follow our top tips and avoid making these common wedding mistakes! 1. Things might be a little stressful, but they should also be fun. Don’t freak out about your wedding planning! 2. Obviously you want your wedding today the best day possible, but obsessing over tiny details is no good for anybody! Try not to lose hours, days or even weeks deliberating over the finer points. 3. A good photographer makes all the difference, so if you’re only going to spend big on one thing, make it this! 4. Yes it’s exciting and probably all you can think about right now, but that doesn’t mean your friends and family want to hear about it all day long too. It’s good for you to take a break from the wedding planning every now and then too. 5. You probably have a clear picture of your dream wedding in your head, but that doesn’t mean you have to do it all yourself. Delegate tasks to your partner, friends and family and it’ll definitely take a load off! 6. Your wedding day can be a bit of a whirlwind so make sure you set aside some time just to take it all in. Whether that’s a few quiet moments with your partner or grabbing a drink with your girls! 7. It’s not often that couples can plan their wedding without having to worry about money, so keep on top of your wedding budget by tracking everything you spend. A budgeting spreadsheet will work a treat! 8. Planning an outdoor wedding? Brilliant! Not having a backup plan for bad weather? Not so brilliant. Always have a plan B to avoid this scenario as you walk down the aisle. 9. It’s great that you want to keep everyone happy and accommodate everything they would like to see on your big day, but you’ve got to remember that it’s YOUR wedding. Sometimes trying to please everyone just makes things confusing and stressful! 10. Your wedding is a once in a lifetime occasion so try to be in the moment and enjoy it as much as you can while it lasts. Social media can wait, this is your special day. The same goes for your guests too! Want to make sure you don’t look back on your wedding and wish you’d done something a little differently? Then check out The Most Common Wedding Day Regrets (And How To Avoid Them!) and have the perfect celebration!